You may have imported files and documents in your phone so backup the files first. Your phone should not be less than 70% battery charge. Then Extract the files from the downloaded SP Tools and Stock ROM rar folder. Run Flash_Tool.exe file as administrator from SP Tool Folder. From S9201_4.2_Mp_F3F8_B1_IN_MMX_09_FLASHER_USER folder select MT6589_Android_scatter_emmc.txt. You need to check USB mode in Flash Tool and check DA Download All->Speed->Force to High Speed . Then you can start download. Power off your phone and remove the battery. Again put the battery in your Micromax Canvas HD A116 but remember not to power on this time. The progress bar becomes Red - Indigo and Yellow. The process takes around 2-3 minutes only. You will see the Green circle after the Installation is Successful. Then you can Power on your device. 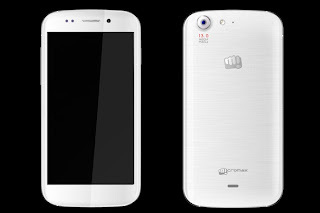 Enjoy your Micromax Canvas HD A116 with the Android Jelly Bean 4.2.1.